Sometimes rock musicians and stars, something not mutually inclusive, can be really good guys. Rather than trashing hotel rooms or getting drunk and beating up whomever, they can give us Live Aid or Hearing Aid. 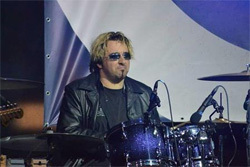 Or in the case of Austrian drummer Bernhard Welz, there's Stay Tuned 1.5, an all-star charity project for the Linda McCartney Centre at the Royal Liverpool Hospital. The Centre exists for the treatment of cancer, of which Ms McCartney succumbed to in 1998. The net proceeds of the album sales will benefit the cause. The all-stars participating on this album of thirteen songs read like a who's who of the UK and European rock scene of the last 40 or more years. The list is lengthy, but includes the likes of Ian Paice, Steve Morse, Steve Lukather, Neil Murray, and Paul McCartney to name a few. You can see the complete roster by using the links above. As for the music within Stay Tuned 1.5, it's pure AOR melodic rock, some of the finest you'll find anywhere. You can rock out to It's Just A Long Way, Young Free And Deadly, and the aptly titled I Don't Believe That Rock 'N Roll is Out. There's also some inspired ballads and soaring anthems. For the former, there's Fading Away and nice piano driven Always Behind You, for the latter the choral-like vocal arrangement of Let The Star Shine On You. To be honest, to these ears, some songs did fall flat, namely Secret Land and Wanna Give You My Lovin, which failed to hook me like the others. But that's not to say they are terrible songs, not in the least. Nevertheless, you have some bonuses at the end: A live recording of Deep Purple's Child In Time and Paul McCartney's wonderful Maybe I'm Amazed from a 2014 recording. The song was a tribute to his wife Linda who helped him through an episode of depression during the break up of The Beatles. 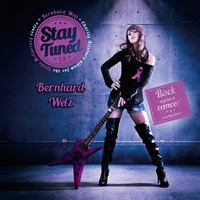 Fundamentally, in the end and regardless of not liking every song, Bernhard Welz' Stay Tuned 1.5 is a fine and entertaining album of AOR melodic rock and supports a very good cause. Buy it for the latter, enjoy it for the former. Easily recommended. In the end and regardless of not liking every song, Bernhard Welz' Stay Tuned 1.5 is a fine and entertaining album of AOR melodic rock and supports a very good cause. Buy it for the latter, enjoy it for the former. Easily recommended.